I am here to release a script I created that randomly generates IEDs. It is based off of the original work from Tankbuster and Mantls's update on that. If you want to change where or how many IEDs are spawned when the mission starts, modify the variable called iedInitialArray in Ied_Settings.sqf. There are several ways to define where you want the IEDs placed. //These are the actual IEDs that will spawn. Add them using one of the following formats. //mapLocations must have their type defined as one of "NameCityCapital","NameCity","NameVillage", "NameLocal"
The way it works is that it will use the markerName as the center and find all the roads within the radius of the marker (make sure you set it! ), then it will randomly place real and fake IEDs somewhere within it. There are several predefined locations for Altis in EPDIed_Settings.sqf that you can use if you don't feel like making your own markers. As of version 1.3, you can also use the names of locations in the game. If you want to share your predefined locations for other maps for others to use, feel free to, and I will post them here on the front post. Here is a map of where each AltisRandom corresponds to. If you do not specify how many to place, it will calculate an amount based on the size of the marker you gave it. If the marker has a size of 1, it will place exactly 1 IED in that exact spot, allowing you to pick where the IED is at, rather than a random road near the marker. There is an example of each type in EPDIed_Settings.sqf. Secondary IED - Designed to kill first responders after the other IEDs goes off. Light Armor IED - Will destroy hunter type vehicles and usually disable marshall type vehicles. The type of IED also determines what size the object it is hiding in is. 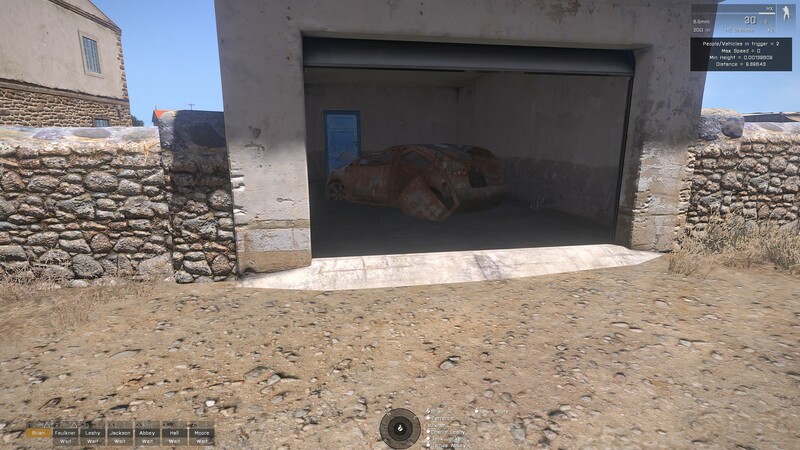 Heavy Armor IEDs will be hidden in things like trash piles and wrecked vehicles. Infantry IEDs will be hidden in things like buckets and tires. IEDs are set off based on speed and proximity. If your horizontal velocity squared is higher than 2.8, and you are within 11 meters of it, you will set it off. The IEDs can be disarmed if you have the appropriate items and are within 3 meters. If you fail while trying to disarm an IED, you will set it off. EPD_IED_debug - If this is set to true, it will create map markers indicating where the IEDs and fakes are. 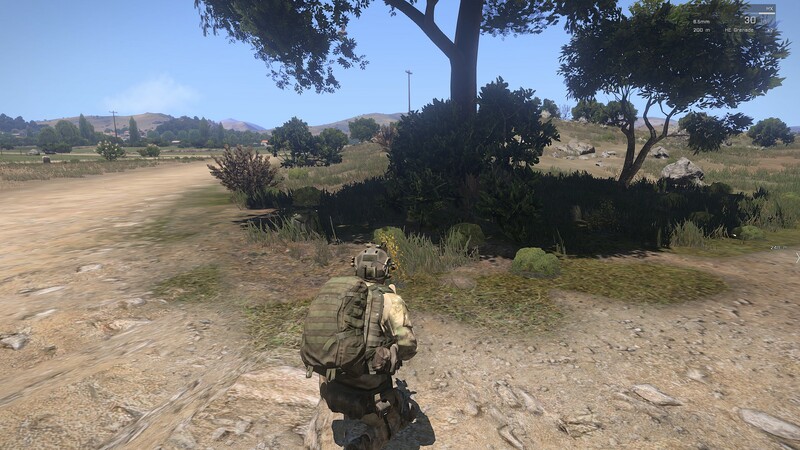 It will create a message showing if a player is near an IED and give their distance and speed (see picture 2). It will also create a message if there are secondaries incoming. These will only show up to the person who is the server. This is mostly useful for testing while developing a map. hideIedSectionMarkers - Set this to true if you want it to hide the marker you used to position the IED circle. hideSafeZoneMarkers - Set this to true if you want it to hide the marker you used to position safezones. itemsRequiredToDisarm - A player must have all of these items in order to have a disarm option. predefinedLocations - If you want to use the same locations over lots of missions without having to create markers over and over, define them here using the following format ["Name",[LocationX,LocationY,LocationZ],size]. 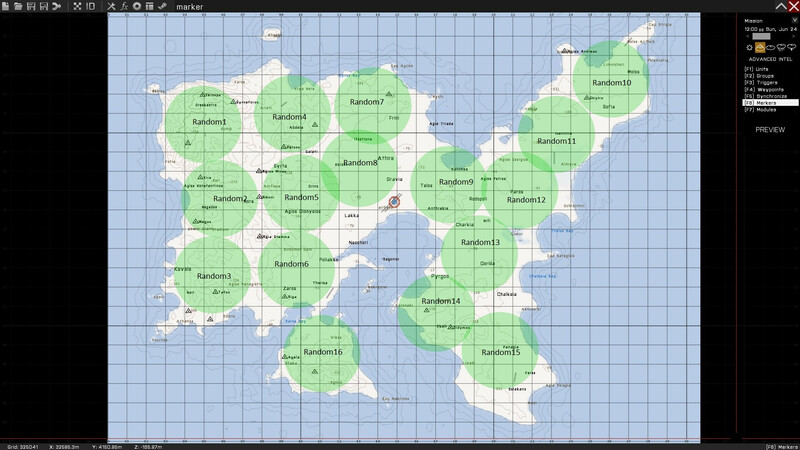 Most of Altis has been provided as an example. allowExplosiveToTriggerIEDs - If this is set to true explosions can set off the IEDs. This will return a randomly generated string of the new section created, hold onto this if you plan on doing any other functions with this section. This will return the sectionName string you passed in, hold onto this if you plan on doing any other functions with this section. If you want to know how many IEDS have been blown up or disarmed in a section, use the GET_IED_SECTION_INFORMATION function. If you want to know how many IEDs remain in a section, use the GET_REMAINING_IED_COUNT function. If you want to remove a section of IEDs, use the REMOVE_IED_SECTION function. If you would like to set up ambushes and the like, you can check the value of lastIedExplosion to get the location of the last IED to go off. Then have your units react appropriately. Triggers are now created and deleted as they are needed to reduce the strain on the server. Only IEDs with a soldier or vehicle within 250 meters of them will have a trigger actively checking for victims. Smoke plumes now travel much faster. Reduced the number of plumes for each IED. Rocks are now flung a little bit farther so you can see them outside of the smoke. Cleaned up the description.ext entry. Reordering of explosion events to make it seem more natural. Removed some potential race conditions. Fixed incorrect copy paste error that appeared in version 2.0. Thanks Badger1815! Changed the small IEDs. Their primary purpose is to kill infantry and damage hunter type vehicles. Changed the medium IEDs. Their primary purpose is to take out infantry and hunter type vehicles. They can disable marshall type vehicles fairly easily. Changed the large IEDs. These are bad for your health. Changed secondary IEDs. Should not damage vehicles as much as before. Projectile detection now looks in the config to see if a bullet is explosive, rather than maintaining a list of explosive projectiles. Merged files that do similar things, to help make it easier to maintain. Refactored a lot of code. IEDs now produce a simple form of fragmentation/shrapnel to make them deadlier. Increased the disarm action to 2 animations. Added functions to create and remove sections of IEDs during a mission. People that are smarter than me can come up with a caching scheme if they want to. Added the ability to not remove safeZone markers. Added lastIedExplosion variable that holds the last location of an IED explosion for people that want to do something special when an IED goes off. Ambush? Renamed the debug variable so it is unique to the script to prevent conflicts with other scripts. In an attempt to overcome the inaccurate reporting of speed in the game, players crawling will not be able to set it off, even if the game inaccurately reports them going over the max speed. You can now reference places in the game without making markers or having to define them. Hat tip to KevsnoTrev for pointing me to the config. Added a safeZone section to the settings. Randomly created IEDs will not spawn in here, but specific ones will. Large safeZones and lots of safeZones will slow down the initialization. New smoke cloud particles that produce significantly less particles than the original. Sometimes the IEDs will spawn behind a wall. Deactivating a charge near an IED will set off the IED.